Faced with changing student demographics and needs, Humboldt State recently launched the Center for Teaching & Learning (CTL)—a clearinghouse of resources designed to support faculty and ultimately help them become more effective teachers. Instructional Designer Kim Vincent-Layton and Art Professor Julia Alderson have been building the foundation for the Center for Teaching & Learning as crews put the finishing touches on the CTL’s new space in the Library.“The center is about helping instructors be more thoughtful and inclusive about their content and teaching,” says Art Professor Julia Alderson. Over the last few months, she and Instructional Designer Kim Vincent-Layton have been building programming infrastructure as the center looks for a director. The CTL comes amid a renewed focus on student success by the University, California State University system, and colleges nationwide. The center addresses some priorities outlined in HSU’s five-year road map known as the Strategic Plan. It also supports Reimagining the First Year of College. In 2016, HSU became one of 44 institutions to join the program dedicated to making significant improvements in students’ first year experiences, including a sense of belonging and retention rates. In the meantime, the CSU launched the Graduation Initiative 2025, which is focused on increasing graduation rates and closing achievement gaps. Faculty development is one way of achieving these institutional goals. Offering professional development through one source isn’t new. Years ago, faculty turned to the Center for Excellence in Teaching and Learning until its services were decentralized and redistributed across campus. Now, working closely with the Office of Diversity, Equity & Inclusion, the CTL is a one-stop shop that connects faculty with campus resources more conveniently and efficiently. 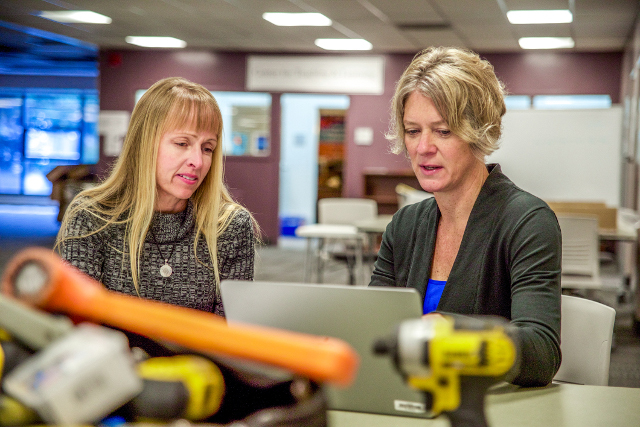 Instructional designers, librarians, and the team that supports the Canvas learning management system are now housed in the center’s new space on the third floor of the University Library. “Many times when I’ve worked with faculty, I’ve had to direct them to different places on campus to get what they need. Now it’s all in one location,” says Vincent-Layton. Also centralized is knowledge. Acting as an information hub, the center sponsors and promotes everything from workshops to lectures that cover a range of issues. Right now the CTL is partnering with several other campus groups to facilitate a four-part series called “Student Success Summits,” which address inclusive and equitable pedagogy. Other resources include teaching tips, mailed weekly to the campus, on timely topics like the Deferred Action for Childhood Arrivals (DACA). Vincent-Layton and Alderson also work one-on-one with faculty, providing advice and feedback. “Just recently a professor came in for syllabus help, so we explored the grading scale and how grades are weighted to support the students’ learning, “ says Vincent-Layton. Other important aspects of the center include assessing the impact of strategies and changes that faculty may have implemented, and examining institutional statistics (student demographics, retention, student success rates, etc.). Such data, says Alderson, gives a snapshot of what’s working and what isn’t and can be used to inform decisions on pedagogy or programs. Alderson emphasizes that assessments are for informational purposes only, and are not evaluations tied to promotions, tenure, or retention. The identities of faculty who use the CTL are confidential, as well. So are professional observations, interactions, or conclusions related to specific faculty or cases. In other words, the CTL is a place to learn and grow. “This is an environment that feels very safe—an informal space explore, learn and get support from other faculty,” says Alderson.